This is the headstone of my wife’s 5th-great-grandfather on her father’s side, Carey Toney. Carey was born 3 Oct 1763 (or 1757) in Buckingham Co., Virginia to William and Margaret (SUTHERLAND) TONEY. He married Elizabeth DOREN in 1789. Later they traveled to Ohio where they lived out the rest of their lives. 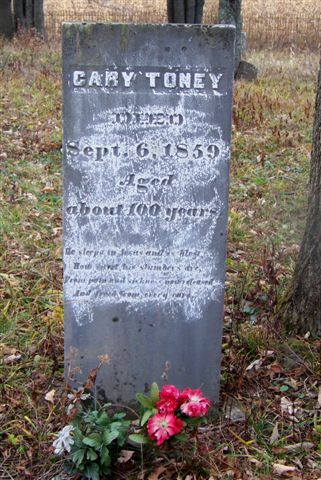 Carey died on 6 Sep 1859 at the age of, as the stone says, “about 100 years.” He is buried with his wife at Railsback Cemetery in Union County, Indiana.